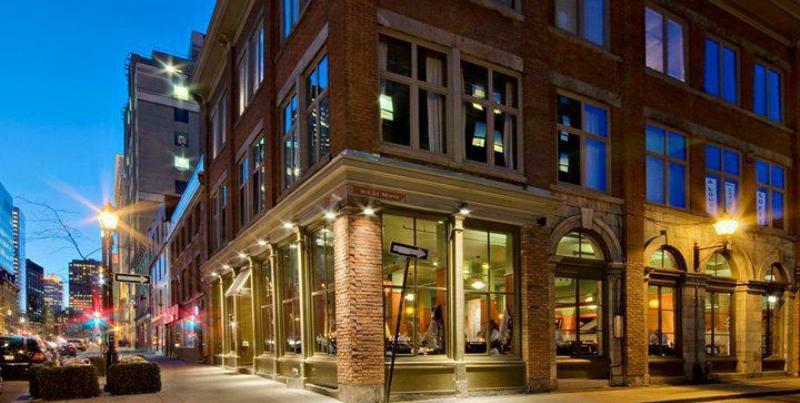 McGill Street, in Old Montreal, is dotted with plenty of wonderful places to eat, drink and be merry. Surrounded by some of the most beautiful and unique buildings in the city, this is always a pleasant of the city area to visit. A mainstay on the street since December 2006 is Vallier, a restaurant that constantly delivers top notch service and delicious food. Vallier has been thriving for as long as it’s been open because it stands out where it matters. The unique décor is a throwback to a time when pistachio was the color du jour and orange went with everything. The restaurant’s designers incorporated these colors in a way that works very well within the space and feels reminiscent of a modern, minimalist 70s bungalow (in a very good way). The elegant bar stands out as art with its shiny metal ridges and touches of colored hanging lamps, yet another wink at the past. The use of warm woods and supple, diamond embroidered leather in the seating is both inviting ahen cozy. When Vallier opened, Montreal was still in the beginning of its comfort food revolution. This restaurant was on the forefront of the comfort food trend, with their versions of updated favorites. It was over five years ago when I first tasted their Mac & Cheese and became obsessed with their delicious take on Sheppard’s pie (they use duck confit instead of beef and I can’t tell you enough how you absolutely need to try this). Though the menu has evolved over the years, these items that many of us love have become the new classics. The service is incomparable, as a team of waiters are present from the minute you’re seated, all the way to end of your experience. From taking your order and checking in at the right time, all the way to folding your napkin while you’re away from the table, it’s paying attention to the littlest details that make service at Vallier stand out from the rest.